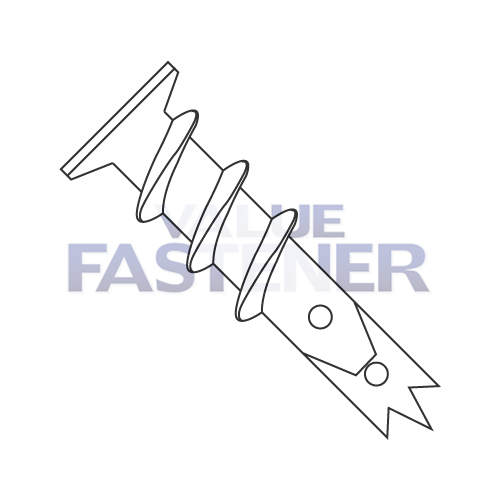 Home > Anchors > Wallboard, "One-Step"
Wallboard anchors are a tubular device, tapered from top to bottom, with a countersunk lip at the top end, a deep cutting thread around the outside of the anchor body, and a tapered end at the bottom designed to puncture and drill a hole in drywall. The wallboard anchor drills its own hole in, and works in any thickness of drywall, without tearing the paper coating. The wallboard anchor can easily be backed out of its hole with a #2 screwdriver bit. The wallboard anchor is designed for use in lightweight applications, such as curtain hardware, small pictures and lightweight signs. The wallboard anchor should not be used for overhead applications. The nylon variety is used when requiring a non-conductive anchor.